DVL input in the Apogee-E is a big advantage. 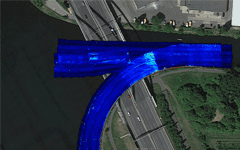 It helps for real-time GNSS outages, especially under bridges. The vessel «Spreegrund», property of WSA Berlin, has been equipped by MacArtney Germany, with state-of- the-art equipment including the Apogee-E, the highest accuracy inertial navigation system from SBG. The catamaran survey vessel named «Spreegrund» serves as survey vessel on German lakes, adjacent canals, and rivers (Berlin, Brandenburg, Eberswalde, and Lauenburg). It carries out complete surveys at speeds of up to 6 knots and water depths down to 20 meters. The onboard control system and software work to ensure optimal data acquisition from the survey sensor suite. It is capable of handling enormous data stream of up to 25,000 soundings per second. 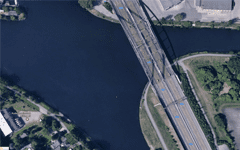 GNSS receivers are perturbed when vessels are crossing bridges and may cause outages or incorrect data. In the case of WSA Berlin, this is a day-to-day challenge, explaining why MacArtney chose an Apogee-E inertial navigation system connected with their own Dual-antenna GNSS receiver (Septentrio inside). “We needed the highest accuracy INS to maintain the very high precision of the overall equipment,” states Alexander Schmidt from MacArtney Germany. We obtained excellent results with the Apogee-E, the images speak for themselves. 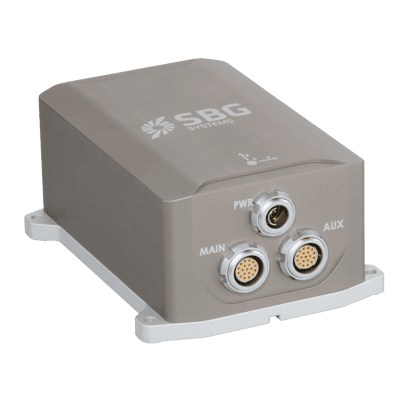 The Apogee-E is the only INS of its category to fuse in real-time inertial data with and external DVL and two GNSS receivers. 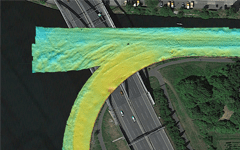 Data are fused to generate outputs to the echo-sounder computer for motion compensation and georeferencing. When GNSS outages occur, the Apogee-E is able to maintain the position in real-time. Its performance is even better when aided by a DVL. The INS integrates velocity data to the internal algorithm to reduce the inner drift of the IMU . “We obtained excellent results with the Apogee-E, the images speak for themselves” to conclude Alexander Schmidt, Technical Sales Manager at MacArtney Germany.